This month, we are highlighting a few of our many outstanding English immersion students. These students have come to Denver to immerse themselves in learning English for a variety of professional and personal reasons. 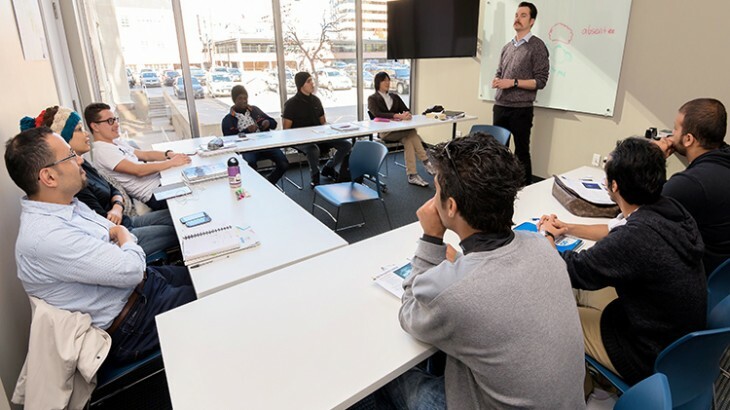 English immersion programs are one of the best ways to become proficient in the second language while developing an increased cultural awareness. Immersion programs also energize the learner, inspire real motivation to learn the language, enable learners to overcome shyness in English and allow the learners to extend their contact with English. I know, I know, you’ve heard that all 1,000 times before. And if you are considering an English Immersion Program, you are probably wondering what to expect. From my own personal experience, living in France and Argentina were the best things I ever could have done for improving my French and Spanish. The experience can be quite over-whelming though. The first time I arrived in France, I was in awe with all the French that was everywhere! No matter where I looked, on billboards, graffiti, on the television…everything was in wonderful, beautiful French. The first thing I tried to do was remember every word I saw, which quickly proved impossible. But when I settled down and relaxed, everything came much easier to me. The immersion experience is different for every person. Here are some of the phases that you may pass through during your first immersion experience. Honeymoon phase: During the first days you’ll be fascinated by the new culture. You’ll feel much like a tourist on vacation, wanting to see and do everything. But this mentality usually disappears after a few days, and you’ll have to cope with the realities of daily life. Hostile Phase: Then starts the next phase, feeling hostile and frustrated by difficult situations you encounter. There seems to be e-mail trouble, language trouble, housing trouble, transportation trouble, shopping trouble. Sometimes it’s too much to deal with! Grin and Bear It Phase: Finally! You start to feel more comfortable and can communicate more with others and even get around on your own. Sure, you still have the occasional difficulties, but you are starting to adjust and adapt! You may even begin to joke about these difficult situations. You are on the road to recovery! Effective Adjustment Phase (Last Phase): You’ll start to accept the new way of living and may even begin to enjoy the food, music and people. You’ve truly adapted and will probably miss the country and its people when you leave. Be ready to make mistakes. Let’s face it nobody is perfect, especially when it comes to learning a language. Don’t be too hard on yourself if you make a lot of mistakes. After all, making mistakes is the best way to learn. Communicate. This has to do with verbal and non-verbal aptitudes – listening, observing and responding. A perceptive, insightful visitor will generally adjust to a new culture more quickly. Be curious. You’ll adapt more quickly to a culture if you actively seek out to know more about it. Have a sense of humor. Sometime difficult situations may arise when you’re abroad. Just smile, shrug and have a good laugh. It goes a long way. Have you done an immersion program in a foreign country? If so, what was the biggest challenge you faced? Share your thoughts by leaving a comment below. And don’t forget to check out our English immersion student profiles: Ramiro Gallo, Amer Alshaibi and Orlando Müller. esl-blog, Meet our students!, The ESL Classroom Academic English Program, business English, ESL students, learn English in the US. permalink.